what year is this Ford Model T? It looks like a non-brass car to me. 1917 to 1919 and/or 1919 to 22ish with no starter. So sometime between 1917 and 22ish. Different sized front and rear wheels. 1917-1919. They used the same wheels on 1919 to 22ish if sold without starter. Another couple of ways to narrow down the year is: location of the rear end fill plug (in line with the center of the axle or slightly below). Also are the wheels round or square felloe? If square felloe and/or lower fill plug=early 20s year car. I can't tell for sure expanding the picture but looks like square felloe to me. Maybe someone with better computer and eyes can tell for sure. It is in a small Village called Vedde. The building is a warehouse for a local merchant. "Colonial" refers to that there is a retail shop, where you can by all you need to the household - including spices and other "colonial" goods. 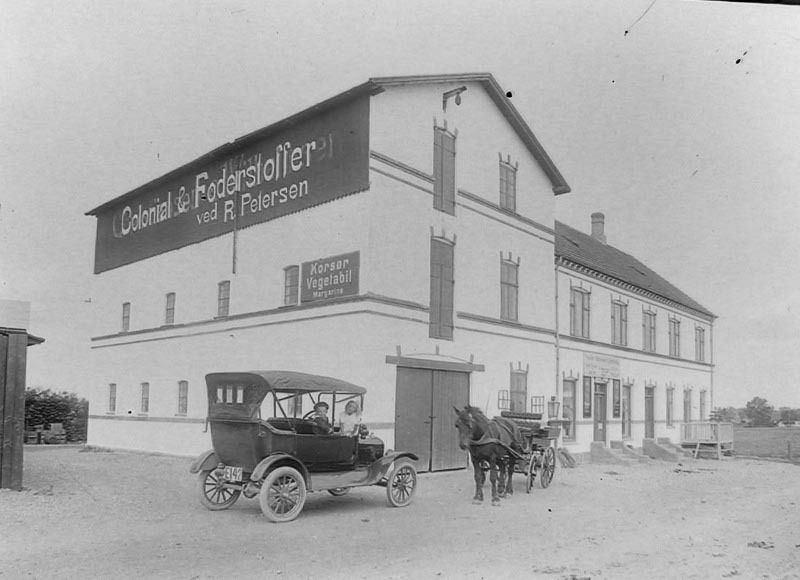 "Foderstoffer" is feed for the animals (on the farm). I thought the model T looked newer than 1920and the interesting thing is, that the licenseplate is a danish "Type 1" that was used from 1903 - 1919. If it was a Model T newer than 1919 this picture was a proof of reuse of licenseplates where the old type was used even though the types have changed. However - given the majority this is most likely a pre 1919 Model T and the licenseplate supports that. That also makes it a Model T that are imported as FMC A/S was established June 6 1919 where they started assembling Tourings in a small shop in Copenhagen. Help out a new guy, please. What is the give-away, visible in this picture, that clearly shows the car to be a non-starter car? I have zoomed in and I can't seem to see the floorboard clearly enough to make out the lack of a starter button. i'm no expert but i think it's the oil side lamps? Bud. Five piece rear tub says 1920 or earlier. It does appear to have the front wishbone above the axle which suggests 1917 or 1918. Corey -- Welcome to the Forum. This is the correct place to pose any questions you might have about Model T's. Since you appear to be relatively new to Model T's, I recommend that you acquire a copy of Bruce McCalley's book, "Model T -- The Car that Changed the World" or purchase his "Encyclopedia" which contains pretty much all of the information in that book, plus some more recent updates. As we continue to research Model T's, we find information which refutes some of what was accepted knowledge a few decades back. So the Encyclopedia is more up-to-date than Bruce's book, but it still is the most informative book about Model T's available. Beginning with the 1919 model year, closed Fords (Sedan and Coupe) were equipped with an electric starter and generator. Those so-called "electric" Fords were also equipped with an electric tail light and demountable-rim wheels, and they had no cowl lamps (like the '19 Coupe on your profile). Those are the clues others used to draw their conclusions about the car in the picture. Open cars (Touring and Runabout) had the option of added electric equipment beginning with the 1920 model year. Non-electric cars still were available through about 1926, and they had the kerosene cowl lamps and tail lamp, and non-demountable wheels in two different sizes for front and rear. All of what I've just noted is pretty common knowledge to folks who have been into Model T's for much time. Don't feel badly about not knowing this stuff until now. None of us was born with this information, we all had to learn it at some point. And please don't be intimidated about asking questions here. That's what this Forum was designed for. We're all glad to help. Corey I've been around Model Ts all my life 52 years and don't know that stuff either. I'm afraid I only pay real close attendsion to the brass ts as that is what we have. Learning some thing new every day keeps the mind sharp. In 1919 Ford started offering a starter (self commencer some call it), generator and battery. To keep the cost of a "base" Model T down, Ford offered you a car without the starter, generator or battery. If you bought the starter version you did not get the oil lights on the dash (and rear light) because you had good reliable electric lights. If you didn;t get the starter yo also didn;t get the battery so the oil lights were still necessary. Nowadays, you can't count on that as many factory equipped starter cars now have oil lights because they are part of the Model T kitsch and were added by a recent owner. Be carful when you say that 19 Ts came out with starters. I believe that it was the summer befor they came out with starters in fact I have changed 19 blocks out because the did not have a place for a generator. Nice looking coupe in your profile. Welcome to the forum and to the fun of sorting through various comments, truths, theories, etc. Such as "This is correct" no "This is the way it is" no .... � The good news there actually are usually some reasonable date ranges for things. See also the Apr 19, 1919 entry below reference starter cars did not have the oil lamp mounting brackets or lamps on the windshield. Those reasonable date ranges are documented by very original cars (best example is the 1917 Rip Van Winkle Ford that when photographed in 1978 had only 26 original miles showing on the accessory speedometer when it was photographed in Jul 1978 (ref page 24 of May-Jun 1991 "Vintage Ford"). And also by the engineering change cards and factory drawings and letters at the Benson Ford Archives see Trent Boggess article on the seven different ratchets attached to the crank handles over the years at: http://www.mtfca.com/encyclo/ratchets.htm . Note that the �fossil record� and the �paper record� supplement each other. I.e. if one of them says a change was made � you can usually find the same change in the other record. Or if not, you can often figure out that the part in question (such as the brass bell klaxon horn seen on many 1915 cars) was an accessory rather than an original part supplied by Ford. And of course original documentation and early photos etc. also contribute. The reason I say �reasonable date range� Ford often made running changes rather than model year changes. And often but NOT always those changes were over time when both the new part and the old style part were being used at one or more of the various branch assembly plants around the world. Reference your comment, �Be careful when you say that 19 Ts came out with starters. I believe that it was the summer before they came out with starters in fact I have changed 19 blocks out because the did not have a place for a generator.� That actually is a good illustration of that �reasonable date range� and how there often is an overlap when old and new parts were both used. First starter-type engine made, #2,815,891. Announcement of starters for closed cars on or about January 15, 1919, at $75. T-8793 starter switch plunger for coupe only. T-8794 starter switch plunger for sedan. T-701C starter-type flywheel used on all cars. Starter-type transmission cover used on all cars. T-400D (starter type) cylinder specified for all cars. Note � that does not mean the car had a starter, but that the block installed in the car should have the capability for the generator to be added. And it also implies the trucks were still being fitted with the T-400C non-starter block. So we have about 3 1/2 months of overlap when the new style T-400D starter and the old style T-400C blocks were being installed in the open cars. Last non-starter engine block made on this date. Note that was recorded also on page 519 in Bruce McCalley�s �Model T Ford� and was based on the engine records at the Highland Park Plant. We know that they shipped engine blocks that were assembled at other locations (i.e. some of the Branch Assembly plants � Long Island is often mentioned; Ford of Canada was casting their own blocks, assembling their own engines and I do NOT know when they switched to the starter block and how much overlap between starter and non-starter blocks for Canada. For English Fords I do not have the data on them either. But with what we do have we know that the first starter engine was produced at Highland Park on Dec 11, 1918 serial number #2,815,891 and the last non-starter engine produced at Highland Park was on May 28, 1919 (number not recorded but the last serial number recorded in the Highland Park engine logs for May 27, 1919 was 3,134,021. So at Highland Park factory they had approximately 5 1/2 months when both style engine blocks were made into engines. And over 318,130 engine serial numbers were issued (again some were stamped on a completed engine at Highland Park and other serial numbers were sent to be stamped onto an engine assembled at a Branch Plant). So, Dave, I believe it would be possible to find a 1919 non-starter T-400C block in a car produced at one of the branch plants as late as May or perhaps even Jun. Running into Jul � I would suspect the engine may have been changed out with a truck engine or and engine assembled at a branch plant. Do you happen to have any serial numbers and/or casting dates? And as we slowly highjack the thread � no � I�ll start another thread. If anyone has a May 1919 or later engine that is a T-400C block without the provision for a generator to be added to the block, please let us know the engine number, casting date, and if you know it was originally installed in a car or TT etc. But please do that on the thread at: http://www.mtfca.com/discus/messages/331880/408953.html?1387333756 titled: Any serial number higher than 3,138,400 on a non-starter block T-400C ? Dennis, I blew up the picture to 400x and it seems that the oil filler is high on the axle and the felloe looks to be square. Of course it could be my imagination. Probably the best evidence is Kens observation of the five piece rear tub.